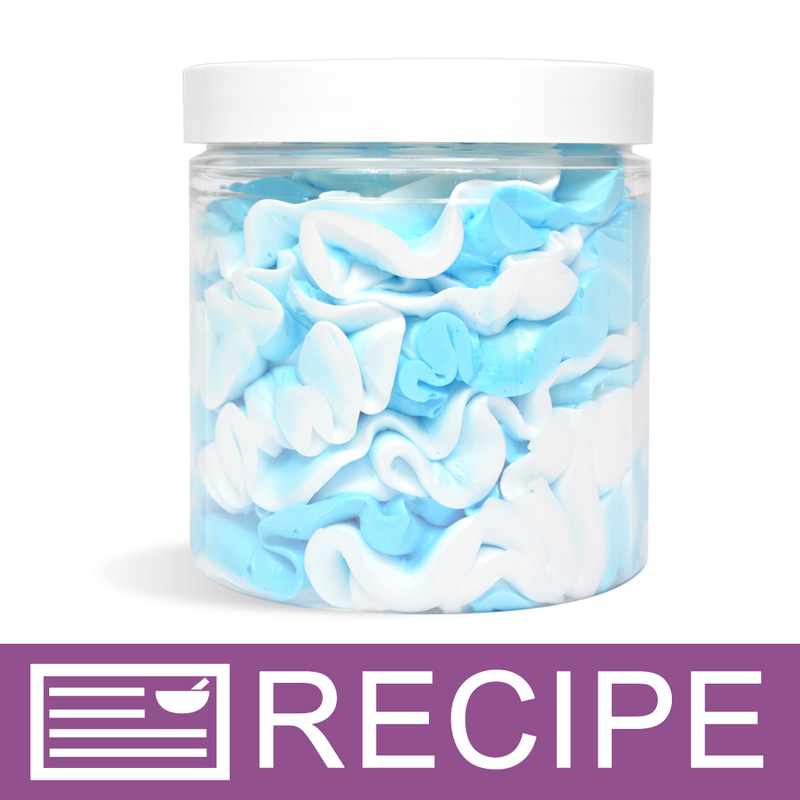 This fluffy whipped soap is blue and white, and will be attractively piped into jars. Foaming bath whip serves as the base of this product, and luxurious additives such as aloe vera oil and coconut oil blend into the soap for a smooth and silky feel. Use this product as soap or as shaving cream. You Save $32.20 by purchasing this kit rather than buying the items separately. Glycerin, Water, Sodium Cocoyl Isethionate, Sorbitol, Propylene Glycol, Disodium Lauryl Sulfosuccinate, Stearic Acid, Fragrance, Aloe Vera Oil, Medium Chain Triglycerides, Sodium Chloride, Vitamin E, Diazolidinyl Urea, Iodopropynyl Butylcarbamate, Blue 1 Lake. COMMENTS: My customers love the smell of this whipped soap. The instructions were easy to follow and in no time I had a beautiful product to show off to my customers. I have a customer who uses it as shave soap. I will definitely make this again. COMMENTS: First time making this and it was a success right out of the box. Easy. Delicious fragrance. Smooth. Did I mention EASY! Bought more immediately because my customers and I LOVE IT! ?? COMMENTS: This kit was fun to make. the instructions were clear and everything was easy to use. I admit birthday cake fragrance isn't my personal favorite scent but I knew my daughter would love it. I don't know if I over mixed it or anything but 11 jars was definitely not enough, I had to rinse out and reuse 2 of the containers that the whipped soap came in to fit it all in some kind of container. "Easy product to make and sell"
COMMENTS: I recently jumped on the Fluffy Whipped Soap wagon and have been doing a lot of research. I tried this to see if it was something I could incorporate into my weekly sales. I tried to make the recipe my own a bit. I found the cake smell very strong, but I plan to just change the scent in the future, and I chose to not make it white and blue, but rather white and pink with dot sprinkles. My only issue was that it was not as fluffy as I would like it. I think if I cool the formula before piping it may work a bit better. Something to think about. I love that Wholesale Supplies offers these kits and I hope they keep coming! COMMENTS: Okay I loved this kit other than the fragrance included. For me out of the bottle the birthday cake just was not strong enough. A stronger scent would make this kit amazing. In testing the whipped soap it lathered well and is really like Whipped Creme when you whip it up. ( no pun intended) I loved everything except the fragrance. Will try it with a different fragrance next time. "I'd like to make this white/blue product white/pink. Which pink do you recommend I use?" Staff Answer You can use the Bath Bomb Red which will be pink in the white base. You can also use NuTone Magenta, Red or any pink or red mica powders. "Birthday cake fragrance has vanilla in it why not use the vanilla stabilizer in the Birthday Cake Whipped Soap Kit. Im new to this just want to make sure I get it right thanks "
Staff Answer You are correct. We have updated this recipe and kit to include Vanilla Color Stabilizer. Thanks for bringing this to our attention. "Hey is there anything that you can add to make this lather better? " Staff Answer You can try adding Bubble Up to the Foaming Bath Whip for added lather: http://www.wholesalesuppliesplus.com/products/bubble-up.aspx. "Does this need a preservative? If so which would work best? Thanks"
Staff Answer This product does not need a preservative since the Foaming Bath Whip has a preservative in it. If you choose to add one, we recommend one for water-based products, such as Germaben II, Germall Plus Liquid and Optiphen Plus. "Can I alter the colors? Is there anything I should look out for? Thanks!!" Staff Answer Yes, you can make this product any color you wish. We recommend any color except the Stained Glass Dyes which can bleed into the white layer. But, if you don't mind this, then these colors would be great to use. "Can you add kaolin clay to this recipe and if so at what percentage do you recommend? " Staff Answer You can add kaolin clay if you wish. We recommend starting at about 1 tsp. to 1 Tbsp. per pound. "I want to buy this kit, but before I do I wanted to know if I need to purchase a vanilla stabilizer for the birthday cake fragrance? Thank you!" Staff Answer We would recommend using the stabilizer as this fragrance has 10% vanilla content. "If I wanted to make a whipped sugar soap, how much sugar would I add. I don't want it to be like a scrub. Do I use granulated sugar or is there a special sugar I should use. " Staff Answer We have not tested adding sugar to this product but you should be able to. Although you are not looking for a scrub here are two of our tested sugar and soap recipes that may help Our Best Ever Sugar Scrub - Vanilla and Vanilla Salt Scrub Cubes. "Can you use this in your hair as/like a shampoo? " Staff Answer The foaming bath whip base used in this recipe is formulated to work as a skin cleanser not a shampoo.